Available in various pack sizes please enquire for further details. Wetting agent is required to be added at the point of use. You can tell us more about your requirements and quantities by clicking the button below. 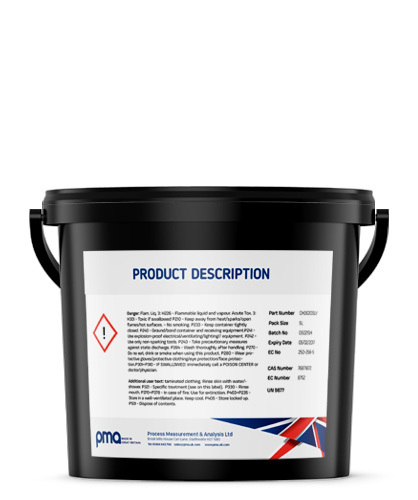 Chemical manufacturing has been at heart of PMA for over 45 years and we also supply reagents for a host of instruments. All of our kits are formulated and quality assured in line with our own ISO9001 accreditation. With PMA, you are in safe hands. An even better reason to contact us about any of our products. We greatly value all of the inquiries which our products and services generate and we would like to reward visitors who use this form and express an interest in any of the intelligent instruments on this page. As a thank you, we will automatically enter you to be in with a chance of winning an Amazon Echo which is valued at £149.99. We will hold a monthly prize draw and inform the winner by email. So what are you waiting for, contact us. A member of our award winning team will respond shortly. Thank you for taking the time to contact us. Copyright 2017 Process measurement and analysis. Where measurement, meets technology.